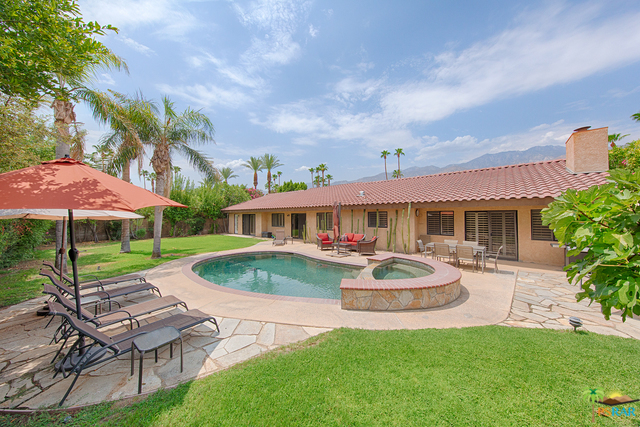 Located a short walk from the shops and restaurants at Smoke Tree Commons in the coveted neighborhood of Los Compadres, this home is the perfect retreat for those who want to get away from it all but still have access to shopping and dining options. Built for entertaining, this home has both a spacious living room, a roomy dining area and a family room complete with fireplace. Guests and family will surely be impressed when you entertain them in the oversized, resort-like backyard complete with a sparkling, Pebble Tec lined pool and spa. With 3 bedrooms and 3 attached bathrooms in 2, 300 sqft of living space, there's plenty of room for large and small gatherings alike. And for those who need extra storage for an additional car or a golf cart, this home features a 3-car garage and an expansive circular driveway. Desert living doesn't get much better than this. If you're looking to start living the desert lifestyle, make your plans to see this home today.